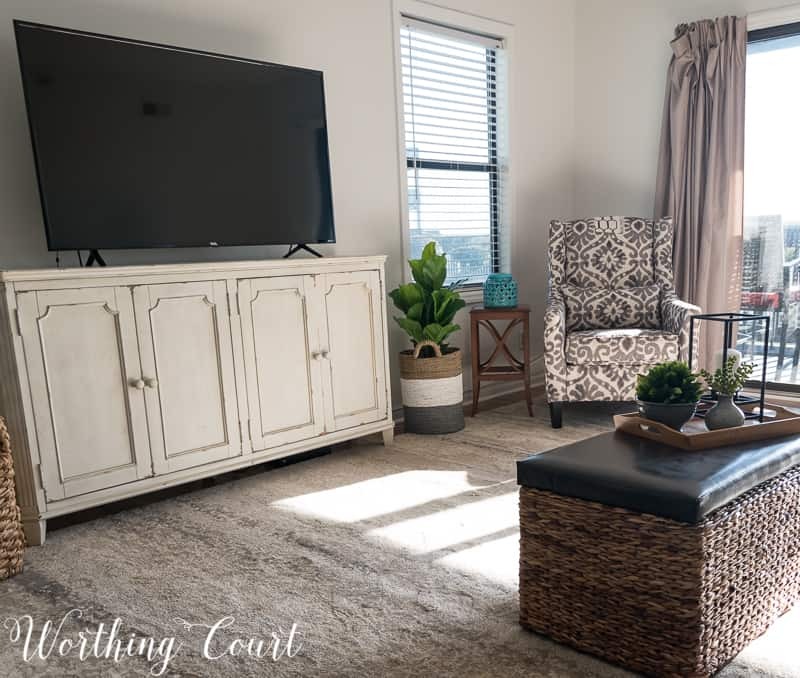 Follow along with the amazing transformation of a dated and worn living room into a warm and inviting modern farmhouse space. If you aren’t already familiar with what I’m referring to, let me give you a little background. We purchased a teeny-tiny 1 bed/1 bath condo on the beach in North Carolina in 2008. That place was a MAJOR disaster zone that we completely overhauled. 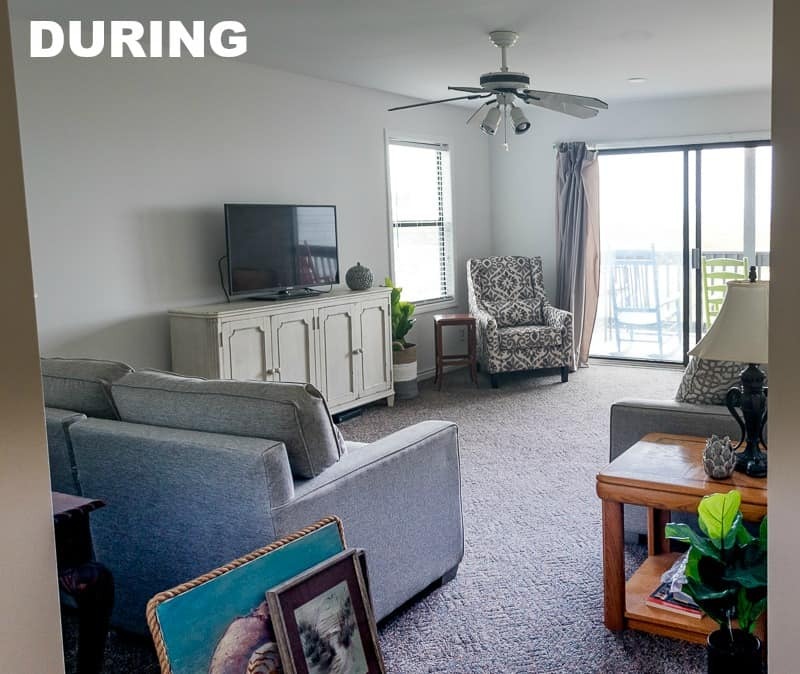 Check out the before and after’s of the condo HERE. We felt very blessed to have an oceanfront spot at the beach, even though it was a super tiny one, and enjoyed it for several years. The only problem with it was that it was so, so small that we couldn’t enjoy it as a family. Yes, we could sleep up to six people, but we were all over the top of each other and it just wasn’t very enjoyable. So, my dreams of having vacations with my daughter, stepdaughters, stepson and their families never really came to fruition in that location. Fast forward to the spring of 2017. After having six or seven offers on our condo, we decided to sell and purchase a larger place! 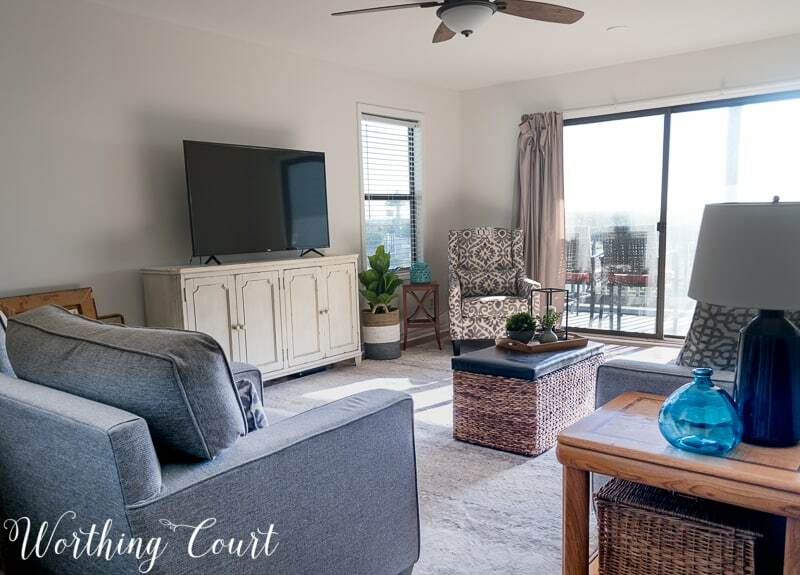 We believe that God blessed us with the desires of our hearts and made exactly what we were looking for (price wise and location wise) available, so we snapped up a larger 2 bed/2 bath condo at a different complex. 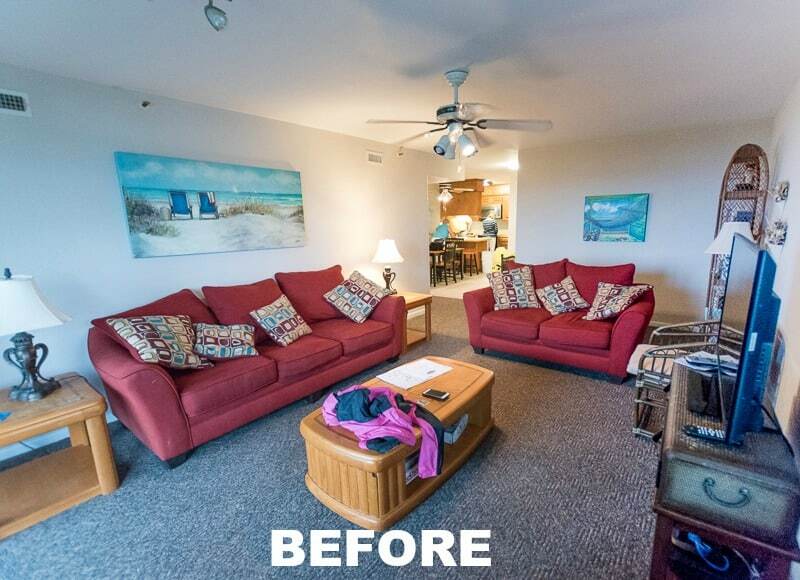 We went from 525 square feet to 1200 square feet and have already been creating new memories during multiple family trips! I’ve already shared my mood board, plans and progress in the dining area because I was super stoked about the gorgeous light fixture that was my inspiration for the space. You can check out the mood board and what we’ve done so far in that area HERE. I’ll have an update on that area soon! BEFORE WE GO ANY FURTHER, BE SURE TO SCROLL TO THE BOTTOM TO READ ABOUT A SPECIAL BONUS ONLY AVAILABLE TO WORTHING COURT READERS FOR A LIMITED TIME! BUT HURRY – THE BONUS EXPIRES FRIDAY, NOV. 17TH AT 11:59 pm EST. But, back to the living room. Along with the rest of the rooms in the condo, we’ve made some major changes and this is what the living room was looking like a couple of weeks ago. At this point, the room has been painted and some new furniture had been added, but the original ugly brown carpeting was still in place. And here she is today! As you’re looking around, keep in mind that this room is still very much a work in progress. You can see areas that are unfinished and artwork and other items stacked against the walls, but we’re chipping away at it bit by bit. I’ve added a short little video down at the bottom that gives a good look at the whole room and a closer look at the rug. The room feels and looks like it literally came to life as soon as I added a yummy, gorgeous area rug! It’s the Breckenridge Seashell area rug from Orian Rugs. 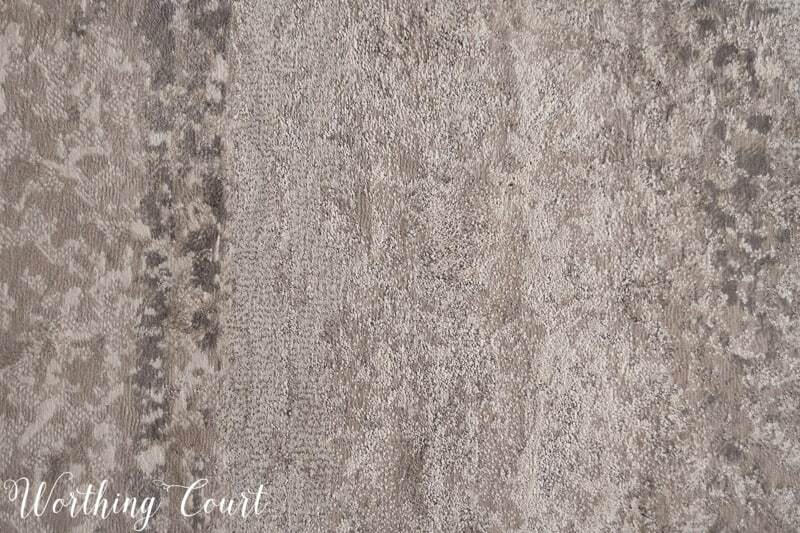 The color combination of ivory, gray, silver, taupe and beige blend together to make a perfect faded design that will fit in with any style room decor. My friends, I wish that you could touch and feel how utterly soft and luxurious feeling this gorgeous rug is! The rug reminds me of the beach and feels like a cloud! This photo shows a bit more of the texture and pile and might help to convey the softness a little better. It’s perfect for our location as it is fade, moisture and stain resistant, non shedding and is designed for durability. Now, here’s the fun part – Orian Rugs is offering an exclusive 15% discount to Worthing Court readers! 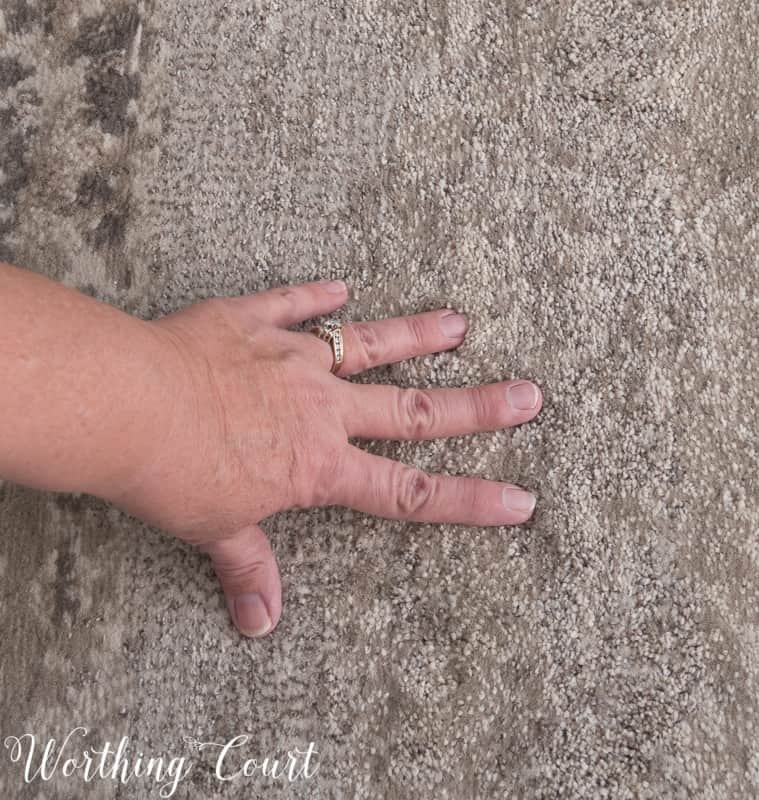 Simply click right HERE to select the rug of your choice from their wide selection and enter the code WORTHINGCOURT at checkout and the discount will be applied. Most of the rugs are already on sale for a fantastic price, but this discount is on top of that. #winwin The discount will expire Friday, Nov. 17th at 11:59pm EST, so don’t wait! Want to see more of the room and take an even closer look at the rug? Check out this short video. Remove and donate old furniture. Paint all surfaces – walls, ceiling and trim. 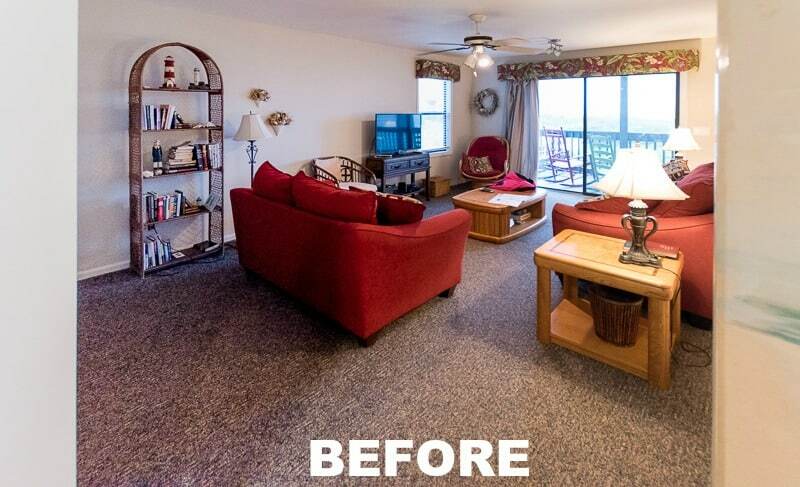 Remove carpeting and replace with laminate flooring. Remove and replace window treatments. Partially done. Paint and recover accent chair. Add bookcases for height and to display accessories. Add a larger tv – for Pookie. Replace or makeover existing end tables. This post has been compensated by Orian Rugs. All content is my own and reflects my personal style and opinion. I only recommend products that I believe in..
Suzy the rug is gorgeous. I can see where the seashell name came from. It also reminds me of a doe, as in deer. Just beautiful and organic. I’m probably enjoying watching the progress as much as I’ll enjoy seeing the finished room. Suzy, This is coming together beautifully! I love the whole feel of the room! Enjoy your beautiful new space! What a pretty transformation! It’s gorgeous! Suzy- the team at Orian Rugs is “crushin’ on you”….thank you so very much for the beautiful compliments and gorgeous room scene!! You are doing such a beautiful job on the condo!Love watching your videos! I hope you have many have days at your beach condo! The condo is looking great! I looked thru the rugs before reading thru your post and stopped on the one you chose! It’s really pretty and I love how you showed it up close and said how comfy it was. Thanks for the code to get even more $ off the already low prices! I love it .Looks more beachy . Love the colors. I got my house beachy and little bit country. Your beach house is looking good! I’ll bet you are so excited with this project. 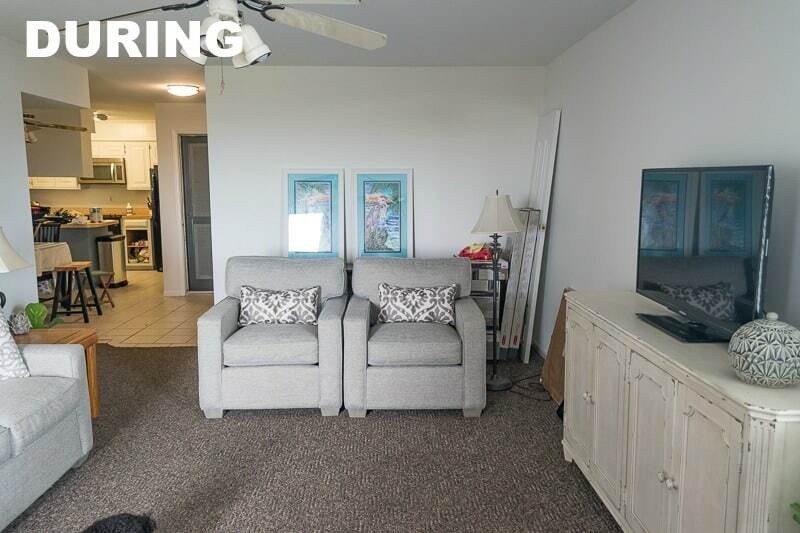 We stay at the beach in the winter, but we rent and don’t own the condo. It is so fun to enjoy the southern decor. Thanks for showing the various stages along with the to-do list. I enjoyed seeing how you put this all together. Love all the changes you have made. Beautiful! I love it! I hope you & your family make many memories & enjoy your new get away place. Wow, how exciting! It looks beautiful! I love your “Modern Farmhouse Beach” and how the pops of color add so much! That rug is divine! I’m going to have to save up for that because it would go so well in my family room! Love it! Love the rug. It looks great with the style you are going for. Your transformations are beautiful! You have made great choices! I love the rug!! That rug is gorgeous! I’ve been looking for one and this might just be it. Love the muted colors and combinations of gray. Your room transformation is very impressive. I ordered Seashell! What a great website and a beautiful rug! I am hoping this rug pulls my room together as well as it has your condo! Thanks for the discount code. It mad a great deal even better! I need a new rug! How fun! It’s looking great! The whole place looks so gorgeous!! I love all of the photos and the rug is wonderful! What a beautiful space! I especially love the TV cabinet! Beautiful. I love the changes you’ve made to your new beach house. It looks so cozy and inviting, and the rug is perfect. It looks like it is twice the size of before room. I love it! WOW! It looks amazing! So clean and fresh!! I wish you could come to my house!! Love what you did to the room and the changes you made. Looks a lot better and very chic. This is an amazing transformation. It looks more like your style that you have incorporated in your home but still has its own style. Love it. Sure is nice to have more room for family visits. Looks lovely. Oh that rug is awesome!! 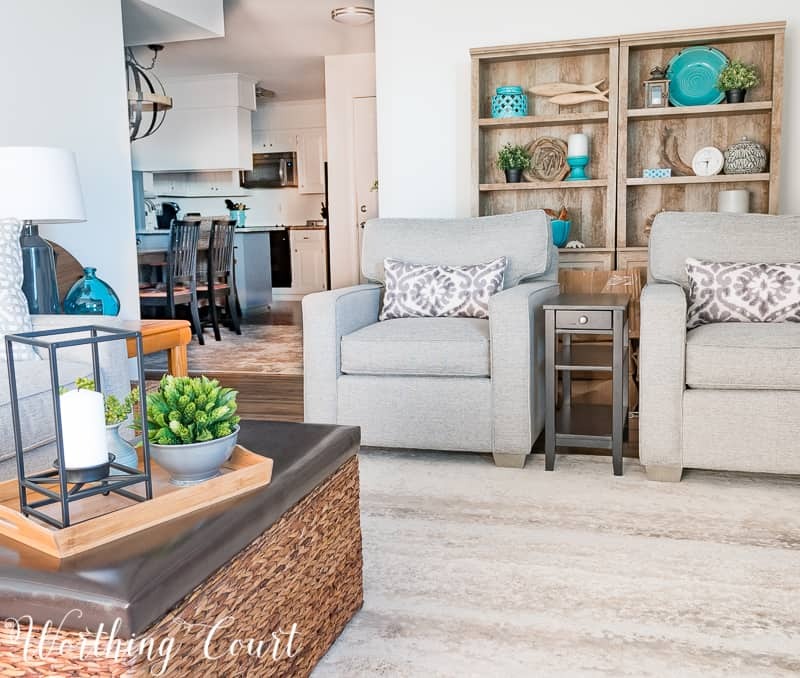 I love the calming gray with pops of turquoise and love love love the dining light fixture! !